Improve care collaboration between hospitals and providers as patients transition from care facilities to the community. Some patients require additional care for extended periods of time after their hospital visits. They may have illnesses or conditions that need treatment over several weeks or months. Usually, post-acute and long-term care facilities handle these types of patients once they’re discharged from the hospital. As a result, many of them are not equipped to properly coordinate ongoing care with the patient’s hospital, primary caregiver, or health-plan provider. Consequently, post-acute care facilities may get left of the loop due to other providers in the care continuum not knowing what services the facility has to offer or the availability of services that best meets the patient’s needs. And because they’re typically not equipped to deal with them, post-acute facilities may also not be aware of a patient’s advance care planning requests. Such situations are often due to the facility’s inability to access the proper documents. Care Directives Advance Directive Information Exchange (ADiE) helps turn LTPAC facilities into valuable partners in the care continuum. It makes it easier for hospitals and caregivers to share important advance care planning documents with post-acute and long-term care facilities. Now, these facilities can access patients’ wishes, especially when it comes to end-of-life care, regardless of their existing technology infrastructure. 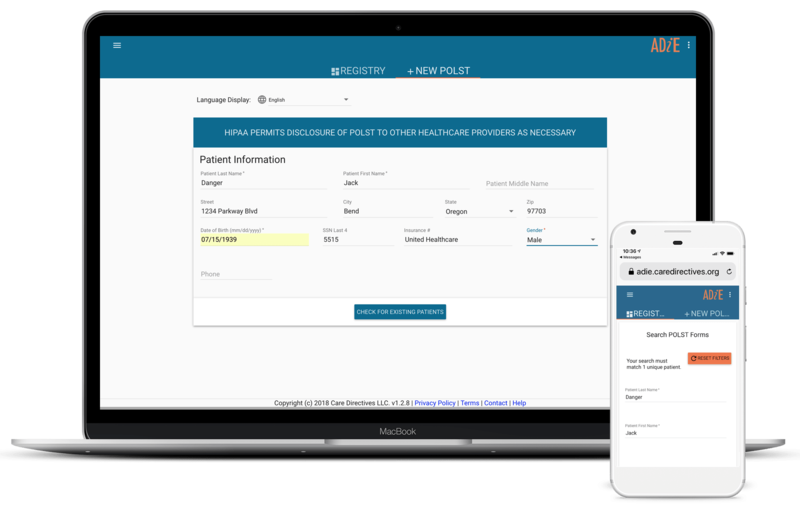 Plus, the sharing of POLST and MOLST forms, ACP forms, and medical directives helps get everyone—discharging hospital, caregiver, post-acute facility, and patient—on the same page to deliver the care that best suits the patient’s needs. And the hospitals and care givers will know for certain the availability of the post-acute care facility’s services, so they’ll be able to make a more informed decision when it comes to long-term treatment.